Thanks to Dr. Eddie Fridman, The Chaim Sheba Medical Center (Israel), for contributing this case. To contribute a Case of the Week, follow the guidelines on our Case of the Week page. (1) If you visit Amazon.com, click here, or on the Amazon banner on the left side of our Home Page, or on any links on our Books pages. By visiting Amazon via these links, Amazon sends us 5% of the cost of all items you purchase, at no additional charge to you. (2) Visit our Buyer's guide, including our Feature page, to learn what new products and services our advertisers are offering. Click on the Buyer's Guide button on the left side of our Home Page, or click here. An 82 year-old woman had a clinical diagnosis of SOL (space occupying lesion) of the bladder neck and proximal urethra, and underwent a transurethral resection. 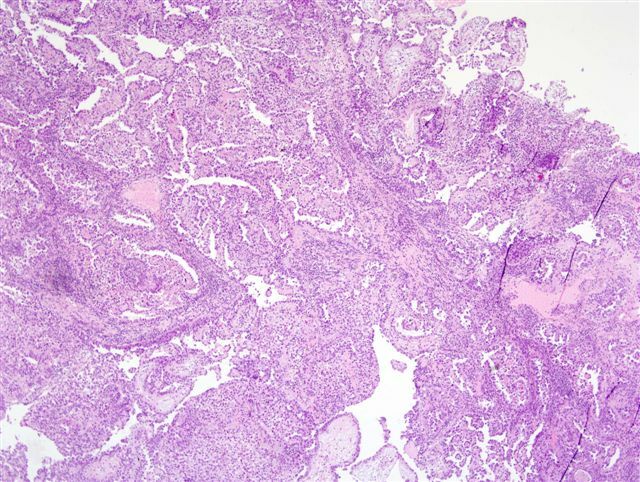 Clear cell adenocarcinoma of the urethra is a rare, high grade tumor that usually occurs in women. Grossly, the tumors are usually papillary. They have various architectural patterns, including tubules, cysts, papillae and diffuse tumor. 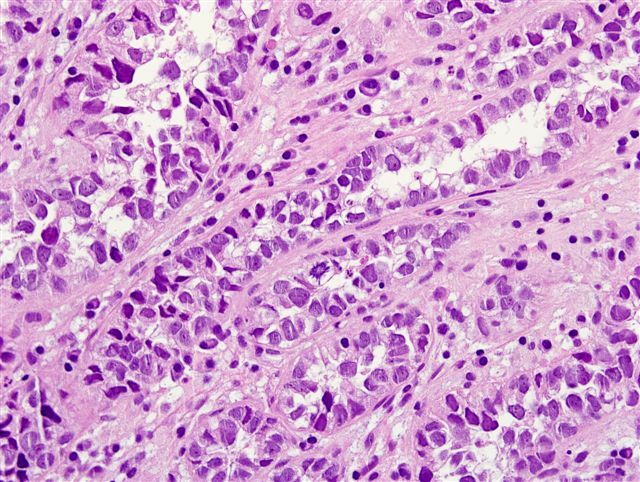 Most tumors have prominent clear cells due to glycogen, and hobnailing. 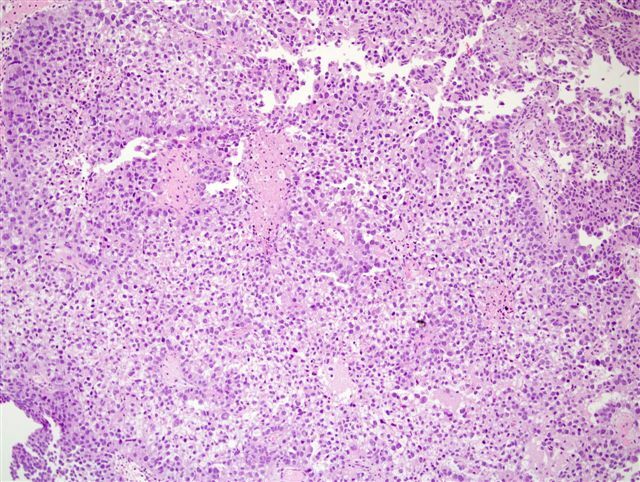 Tumor cells have prominent pleomorphism and marked mitotic activity. There is often obvious muscular invasion and necrosis (Am J Surg Pathol 1985;9:816). 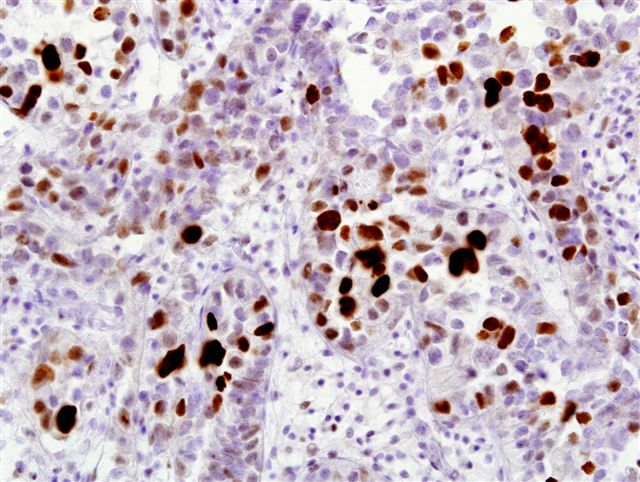 Tumor cells are immunoreactive for CK7, CK903, Ki-67 and p53, and usually negative for CK20. 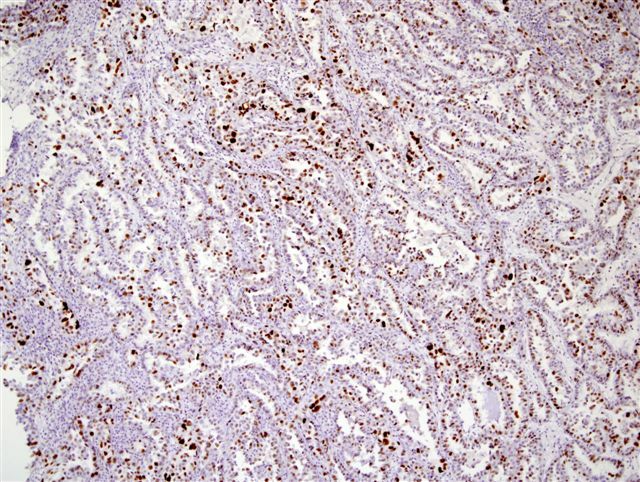 In contrast to most urothelial carcinomas, they are also immunoreactive for P504S and negative for p63 (Arch Pathol Lab Med 2008;132:1417). 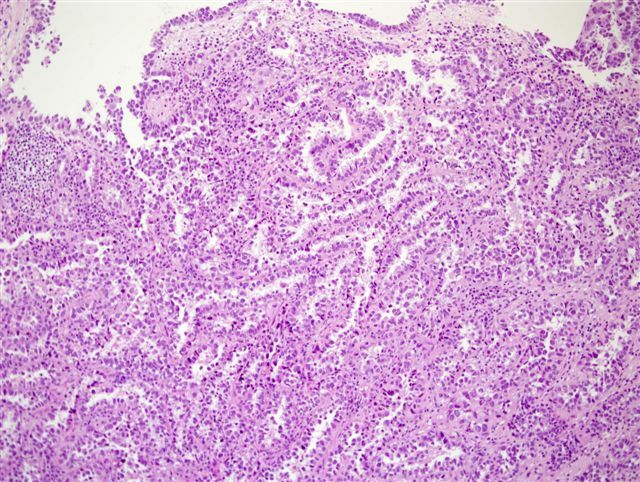 The differential diagnosis includes nephrogenic adenoma, a metaplastic process often occuring in young adults with a history of GU trauma, surgery or stones. 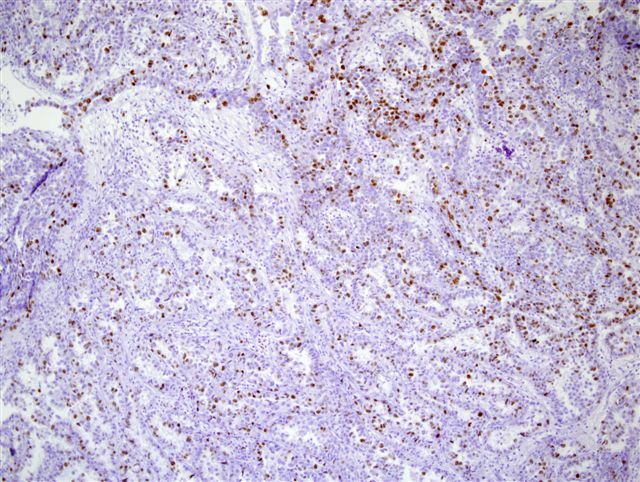 In nephrogenic adenoma, there may be reactive changes in the tumor cells and mitotic activity, but there is no marked pleomorphism or invasion. There are usually no clear cells, and if present, they are focal. 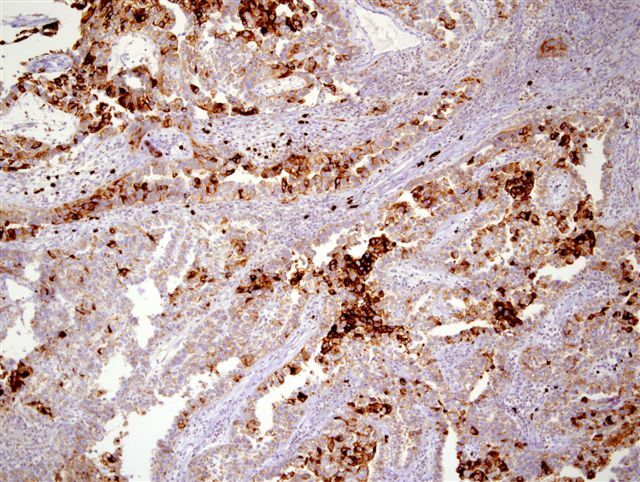 Ki-67 and p53 are usually negative or have minimal staining (Hum Pathol 1998;29:1451). 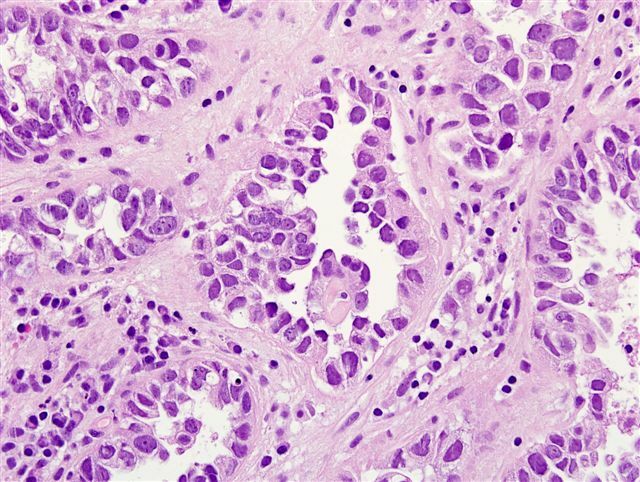 A recent report described clear cell adenocarcinomas that resemble nephrogenic adenoma due to less prominent nuclear pleomorphism, less prominent nucleoli and fewer clear cells (Hum Pathol 2010;41:594). 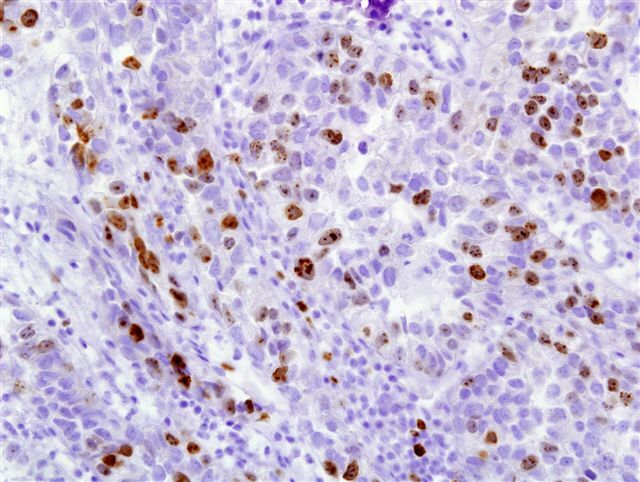 However, this variant of clear cell adenocarcinoma did exhibit extensive muscular invasion, and focal hyperchromatic and pleomorphic tumor cells that would not be present in nephrogenic adenoma. 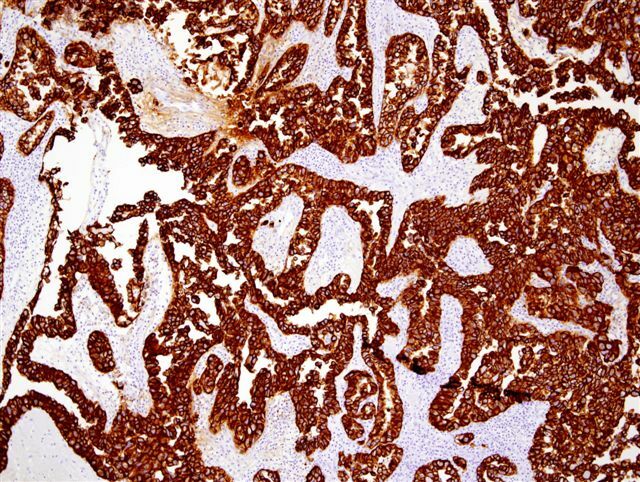 Clear cell adenocarcinoma is an aggressive tumor, with low rates of 5 year survival (Clin Genitourin Cancer 2008;6:131). In this case, the patient received an incomplete course of chemotherapy after her surgery. She was well during the next 3 1/2 years, until 5 months ago, when she underwent pelvic lymph node excision, revealing a few pelvic nodal metastases with a similar morphology as the primary tumor. She is currently without any new disease.